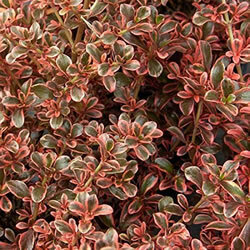 A hardy shrub with stunning obovate variegated foliage. The colour transforms from cream pink tones during summer to an explosion of fire red foliage during autumn and winter. This plant has a low water requirement once established. 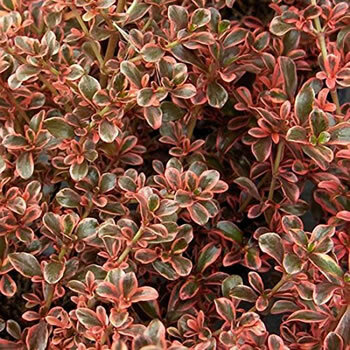 It prefers a well drained soil in the full sun or part shade. It will tolerate coastal conditions. Height: 1m, Spread: 75cm. Evergreen.